The Norway Rat (Rattus norvegicus, also called the brown rat or sewer rat) is a destructive pest found in urban and suburban neighborhoods. These rodents eat and contaminate food, damage buildings and other property by their gnawing and burrowing, and may spread diseases that affect people and pets. Norway rats are husky, brownish rodents that weigh about 11 ounces. They are about 13 to 18 inches long including the 6 to 8 1/2 inch tail. Their fur is coarse and mostly brown with scattered black on the upper surfaces. The underside is typically grey to yellowish-white. Adult droppings are up to 3/4 in (20mm) long, capsule shaped with blunt ends. Roof Rats (also known as “black rats”) are old world (Europe and Asia) urban dwelling rats that range along the lower half of the East Coast and throughout the Gulf States and upward into Arkansas. They also exist along the Pacific Coast and are found on the Hawaiian Islands. The Sun Belt States including Arizona and Nevada have also been infested. They daily explore their territory of 100 to 300 feet. Roof rats will not only nest in trees (especially palms), ivy, and ground cover, but also in upper portions of buildings. Their food source consists of snails, seeds, fruits, vegetables, nuts, pet food and items from unsealed garbage containers. Water is also essential. The roof rat is distinguished by its larger ears, pointed nose, tail longer than the body and an average body weight of 6-12 ounces. Landscaped residential or industrial areas provide good habitat, as does vegetation of riverbanks and streams. They will often move into sugarcane and citrus groves. Many people believe that their oranges are being eaten by fruit bats, when in fact, fruit bats don’t eat citrus. Being agile climbers, Roof rats frequently enter buildings from the roof or accesses near utility lines which they use to travel from area to area. They have been found in sewer systems, but this is not very common. Adult droppings are up to 1/2 in (12.5 mm) long, and are spindle shaped with pointed ends. The damage control methods used for roof rats are essentially the same as for Norway rats. However, a few differences must be taken into account. As with the house mouse, effective control involves three aspects: sanitation, rodent-proof construction, and population reduction. The first two are preventive measures. When a rodent infestation already exists, some form of population reduction almost always is necessary. Reduction techniques include trapping and/or baiting. Poor sanitation and the presence of garbage help rats to survive in residential areas. Good sanitation will effectively limit the number of rats that can survive in and around the home. This involves good housekeeping, proper storage and handling of food materials and refuse, and elimination of rodent shelter (harborage). Outside dog pens must be properly maintained to reduce potential rat problems. Removing clutter around homes allows inspection for signs of rats. Good sanitary practices will not eliminate rats under all conditions, but will make the environment less suitable for them to thrive. Rodent-proof construction is the most successful and permanent form of rat control. Stuf-fit“Build them out” by eliminating all openings larger than 1/2 inch through which they can enter a structure. “Stuf-fIt” is a rust proof copper meshing for sealing rodent entry points. Use it in all kinds of openings to keep out all kinds of pests. When tightly packed into a gap, crack or weep hole, the copper mesh resists being pulled out. Make exclusion work a lot easier. This is a permanent product because it is pure copper. It’s interlocked loops can’t be pulled apart like steel wool. You can tack it, staple it or glue it into the hardest to get at openings. Pur Black is an awesome sealant foam that works great for outdoor applications. Pur Black is dispensed from a professional applicator straw that requires no gun – it’s economical size is great for medium sized projects and one time jobs. Perfect for blending in with an outdoor environment, and won’t get a “dirty” appearance. You can also use this sealant in conjunction with Stuf_Fit for absolute exclusion of rodents, insects, or birds. Applying Stuff-It and a sealant Foam such as Pur-Black or IPF Foam would be perfect for sealing this opening where the sidewalk slab meets the brick of the house. Trapping can be an effective method of controlling rats, but it requires more skill and labor than most other methods. In some instances, trapping may be recommended where toxicants are inappropriate. Try trapping first in homes, garages, and other small structures where there may be only a few rats present. Trapping has several advantages: 1) it does not rely on inherently rodenticides; 2) it permits the user to view his or her success; and 3) it allows for disposal of trapped rats, thereby eliminating odor problems which may occur when poisoning is done within buildings. A few of the traps we use and suggest are listed below. T-Rex Snap Trap– The industry favorite, the Trapper T-REX is Bell’s ‘go to’ trap in its line of reliable traps. The Trapper T-REX offers superior rat capture. Patented, interlocking teeth make rat escapes virtually impossible. The trap is a perfect combination of trigger sensitivity and trap velocity — speed and responsiveness ensure capture. Extensive field and laboratory testing fine-tuned Trapper T-REX to optimum specifications. Safer and easier to use than competitor’s snap traps, Trapper T-REX can be readily set by foot safely on the ground. Press the trap open like a pedal, keeping fingers free and safe. Bell included a removable bait cup that inserts from the bottom of Trapper T-REX. The cup can be withdrawn and re-inserted without the trap being set, which greatly enhances safety and ease of use. Use the T-REX along rat pathways. Try baiting with peanut butter, bacon, fruits, vegetables, cereals, meats, and acorns for wood rats (pack rats). For added protection use the Protecta Evo Express Bait Station. We are getting exceptional bait acceptance with this product out in the field! Even with competing food sources, rodents are eagerly feeding on it. FirstStrike Soft Bait is a soft bait rodenticide from Liphatech. It is highly effective and is easy to secure to bait station rods. The most technologically advanced rodenticide on the market containing Difethialone, which was invented and patented by Liphatech, and has half the active ingredient compared to other anticoagulant rodenticides. Rodent Bait Stations such as the Protecta Evo Express or Protecta LP are used extensively for exterior perimeter protection. Providing perimeter protection around buildings, the home, or next to piles of firewood or excessive harborage areas. Whether you are in a rural area (mesas, mountains, woods) or in an urban environment, these stations will provide you with year round protection from foraging rodents. The ideal spacing for bait stations range from 20 ft. to 50 ft. A lot of homes keep no less than four. One for each side of the house. Used by Pest Control Professionals to remove dead rodent odors, urine and feces odors, skunk odors, as well as odors from chemicals, cigarette smoke, and Earth Care Bags do not have to come into contact with dead rodent or odor causing agent. Simply place the bag near the odor and in 24 hours the odor will be gone. Earth Care acts like a magnet by attracting and neutralizing smells. It is made from an all natural mineral, is non toxic and biodegradable and safe for Planet Earth. It is also safe around children and pets, even if eaten. 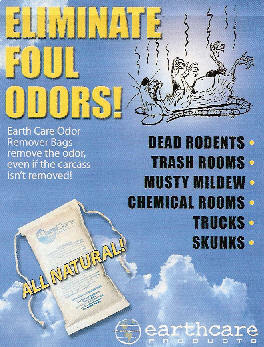 Earth Care adsorbs odors rather than masking them with a fragrance. Covers up to 200 square. Last 3-4 months in use or indefinitely in plastic wrap.